Ever since completing my Mirage TMNT reading order and Archie TMNT Adventures reading order, some folks asked that I do the same for the IDW TMNT series, which has been growing increasingly more complicated. So what they hey. For reference's sake, IDW has been releasing their own line of chronological hard cover collections called "TMNT: The IDW Collection". I'll try to align with that reading order if the collections ever end up contradicting my order, but so far that hasn't been a problem. Note: For best reading order, read "Utrom Empire" all together after "Northampton". Note: #37 and Turtles in Time take place concurrently so it doesn't matter which you read first. Note: For best reading order, read "Mutanimals" all together after "Attack on Technodrome". Note: For best reading order, read "Casey & April" all together after "Vengeance". BEBOP & ROCKSTEADY DESTROY EVERYTHING! Note: For best reading order, read all of "The War to Come" (the main story) before "Inside Out" (the back-up). Note: "From the Heart, for the Herd" and "Triceratots!" take place in the distant past, but their narratives are a necessary companion for the "Invasion of the Triceratons" storyline. TMNT MICRO-SERIES: Most of these one-shots came with notes on the inside cover from editor Bobby Curnow explaining where they slot-in in regards to the ongoing series. In the case of TMNT Micro-Series #7: April, the note on the inside cover places it between TMNT #12 and TMNT #13. Curnow later explained that between TMNT #14 and TMNT #15 was a better placement. INFESTATION 2: Infestation 2 was an event that affected multiple IDW titles without actually requiring any crossovers. The event began in Infestation 2 #1, ran through the title-based Infestation 2 miniseries, then ended in Infestation 2 #2. The Turtles do not appear in the main Infestation 2 miniseries beyond the covers and a brief appearance in a montage, so as such I felt no need to include those issues in this timeline. The events of the Infestation 2: TMNT storyline are self-contained and thus far have not been referenced in any other issues. The issues were also excluded from the TMNT: The IDW Collection Vol. 1 hard cover, making fans question their canonicity. HERO COMICS 2012: “Ready Set Go!” was a short comic by Kevin Eastman published in IDW’s charity book Hero Comics 2012 #1. It was reprinted in the TMNT 30th Anniversary Special where it was designated as being a part of the Mirage universe, rather than the IDW universe. ANNUAL 2012: An official IDW reading guide places the 2012 Annual where I have (between #14 and #15). However, the TMNT: IDW Collection Vol. 3 hardcover (a series that collects the ongoing and minis in a chronological reading order) places it between #20 and #21. Presumably, the reason for this is because there wasn't enough room in Vol. 2 for the 2012 Annual, so it was shifted to Vol. 3 and placed where it works best (as a prelude to "City Fall"). Regardless, the Annual is a self-contained story and reads fine in either placement. UTROM EMPIRE and NORTHAMPTON: The events of the Utrom Empire and Northampton arcs occur concurrently with one another. The Turtles play a minor part in Utrom Empire, with their scenes taking place at different times throughout the Northampton storyline. Their scenes in Utrom Empire #3 actually take place before and after TMNT #32. Personally, I'd recommend reading all of Utrom Empire AFTER Northampton, just because the storylines would flow better that way. X-FILES CONSPIRACY: For those wondering why that issue is not included in my timeline, the events of the X-Files: Conspiracy event were rendered non-canon by the last issue of the miniseries, essentially relegating the chapters to an alternate universe. As a result, the X-Files/TMNT: Conspiracy comic is retroactively non-canon (which may be for the best, as the issue contained several irreconcilable errors in continuity). TURTLES IN TIME: According to Curnow, the 2014 TMNT Annual takes place between issues #32 and #33, while the Turtles in Time miniseries takes place concurrently with #37. It can be read either before or after that one-shot issue of the ongoing, as that story doesn't feature the Turtles in it at all. MUTANIMALS: The events of the Mutanimals miniseries spin directly out of TMNT #43 and then proceed to go in their own direction separate from the storyline of Attack on Technodrome. For reading purposes, as with Utrom Empire and Northampton, I'd recommend reading Mutanimals after finishing Attack on Technodrome. VENGEANCE: According to Curnow, the Free Comic Book Day special, "Prelude to Vengeance" is intended to be read before TMNT #46 but occurs concurrently with that issue (so despite being titled "prelude" it actually takes place between chapters 1 and 2 of that arc). CASEY & APRIL: This miniseries spins out of TMNT #47 with a prologue in the first issue that takes place on the same night. The rest of issue #1 and all of #2-4 take place several days after TMNT #50. As always, I'd recommend reading it altogether AFTER "Vengeance" instead of disrupting that arc's narrative flow. BATMAN/TMNT: According to editor Bobby Curnow, the Batman/TMNT crossover miniseries published by DC Comics in 2015/2016 is not a part of the IDW continuity. The Turtle side of it is "inspired" by the IDW characterization and setting, but is otherwise unrelated to their universe. TMNT UNIVERSE: TMNT Universe is an ongoing anthology series featuring arcs of varying length that don't lead into one another, but tell different stories about the Turtles and the other characters from their book. Basically, it replaces the scattered miniseries by collecting them under an ongoing umbrella banner. The series also features back-up strips that run at a different pace from the main features. Brilliant job with this list! The reading order can be a bit confusing for new fans, so I always use this to show them where the micro issues fit in. Thanks! Thanks for the feedback, man! so the utrom will be before the northhampton? interesting. Thanks a bunch for this list, it helped a lot. IDW's TMNT is like the first actual western comic series I've ever gotten into so a lot of this side story stuff is really unintuitive to me. You might want to add TMNT Annual 2012 right before City Fall. As someone whose only being collecting the trades, I cannot tell you how useful this guide has been. Thanks for this Mark. Soul's Winter was just released (12/02/14) in hardcover format under IDW. Where does this fit on the timeline? Which timeline? "Souls Winter" was a storyline from Mirage's TMNT Volume 1, IDW is just reprinting it with new colors. 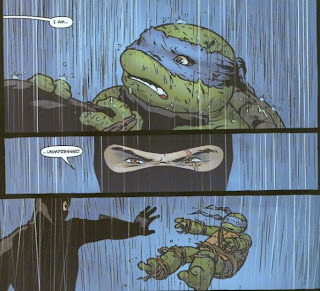 But even as a Mirage story, it was deliberately an alternate universe take on the TMNT, unconnected to any other incarnation. Hey Mark. Thanks for all your reviews. As someone who likes to analyse things, these have made my reading experience much more enjoyable. Also, where do you get all your mirage comics? Those are something I'm trying to collect but I'm not sure where to get them. Regarding the Mirage comics, there's no one answer for where I got them. Some were from back issue bins in various stores, some were from eBay, some were from private sellers, some where from the Mirage site. It took the better part of 10 years to get them all. But the Mirage website is a good place to start. They have lots of issues, mostly at cover price, and they can fill in numerous gaps for cheap (it's just a long wait for them to fulfill your order). LOVE this blog page man! and seriously dude, this page is truly ALL KINDS of AWESOME!!! i'm sorry, i'm totally geeking out right now! just seeing most EVERY TMNT book ever MADE is reviewed here! you even did a timeline for the Classic Mirage comics? i think i've just gone to TMNT heaven? and hopefully this comment posted correctly with my actual profile? Mark's reviews usually take a bit of time for him to post. they are pretty in-depth and i imagine they take quite a bit of work for him to create. being that issue 50 is an extra large issue, my guess is it might take more time than usual? So, April & Casey #2-4 is DEFINITELY set after TMNT#50? Or is that just a place holder until further notice? Just wondering... I'm getting back into the series, and I've picked up from #37 onward. Using this timeline, I'm fixing my stack in reading order. Just wanted to see if that was definitely correct, or if that'll be changed? Honestly, I'm tempted to move all 4 issues of Casey & April to after #50; the only reason C&A #1 is between #47 and #48 is because it opens with a prologue that takes place at the same time as #47. C&A #2-4 take place well after #50, though. Mainly, it's because #47-50 all take place on the same night while the prologue in C&A #1 takes place on that night while the rest of the issues are several days to a week later. Now, PERSONALLY, I would recommend reading all four issues after #50 rather than spread around. Same thing with Utrom Empire and Mutanimals; they read better altogether after the arc they ran concurrently with rather than jumbled up. What is your favorite IDW comic? Where is issue #53 review? why don't you start up a blog and post reviews? let's see how prompt and thorough they are? @Anonymous I don't have any of the comic books. And I can't read them. The review from this blog is all I got!!! Thank you very much for your hard work putting this together. I don't read a lot of comics, but being a big fan of the Turtles on screen, I wanted more. The whole micro-series thing can be confusing and having this guide for reading order is the best thing ever. I am really enjoying them! As always, thanks for posting this. Your site is a constant companion to my reading. How do you find information regarding the names of arcs, what issues they'll include, etc? Regarding the names of arcs, I usually wait until the trades come out and then use those titles for the arcs grouped in each volume. On a few occasions, the arcs are named in the issues themselves or the solicits ("City at War", "Attack on Technodrome", "Leatherhead") in which case I know in advance. Other times, I just have to wait it out or ask the editor directly (which in most cases, he doesn't have an arc title in mind until it's time to collect them in a trade). Can you upload the review for TMNT Deviations 1-shot? I was looking for it just now in the City Fall section. Best issue we've had in a while, And it doesn't even "count"! is Bebop & Rocksteady Destroy Everything #1-2 canon? and btw I follow this continuity religiously, thank you so much!!! It is, but the ongoing hasn't caught up to a point where it can fit in. Once it does, I'll add it to the list. The IDW Collection Volume 2 omitted the first annual but it has been listed in the solicits for Volume 3, I'm assuming that would put it between Secret History of the Foot Clan #4 and TMNT #21 or TMNT #21 and #22, Does this create continuity problems in this order? (I'm reading from the IDW Collection, so I'm behind) If not, I thought you'd like to know to consider changing, if so, maybe you could add something noting a better reading order (like with Krang War, Mutanimals & Casey & April). Also, did you play Mutants in Manhattan? If so, what did you think? If not, I recommend it (although I am in the minority on that). The Annual is pretty self-contained and even IDW has officially placed it in two spots. The reading guide recently published in the back of their books uses my placement (between #14 and #15) while the IDW Collection Volume 3 will presumably include it between #20 and #21 as it works as a prelude to "City Fall". Presumably, the reason IDW has put it in two different places like that is because there wasn't enough space in the IDW Collection Vol. 2 for it, so they put it where it would work best in Vol. 3. Since the reading order they've published agrees with mine, I don't think I need to move it on my list. Afraid I haven't played Mutants in Manhattan. I want to! Unfortunately, I don't have any consoles at the moment. Played some of Transformers Devastation at a bud's place; it's by the same studio. The gameplay was repetitive but it was still pretty fun; I expect the same from their TMNT game. Killer list as usual, and great site. So the Bepop and Rocksteady stuff is stand alone and separate? The Bebop and Rocksteady mini is certainly canon, but it takes place somewhere down the line. The ongoing hasn't gotten to a point where it fits yet, so I'm waiting to see where it can slot in. Has IDW said anything about whether the Ghostbusters crossover will be included in the Collection hardbacks (presumably in V5)? also cover for V4 is now viewable on amazon (awesome pic of Donnie!) and issues 64, 65, Uni3, 4 and 5 covers and blurbs are up on IDW's site (#63 is now out). Any ideas on the allies and enemies 104 page comic? Is this a collection of already released comics or something different? If so where does it slot in on the timeline? Allies and Enemies is a collected reprint of some of the micro-series issues. Is the ghostbusters thing considered cannon? It's not ever referenced that I know of. Figured it was like batman but you didn't mention it. Thanks. 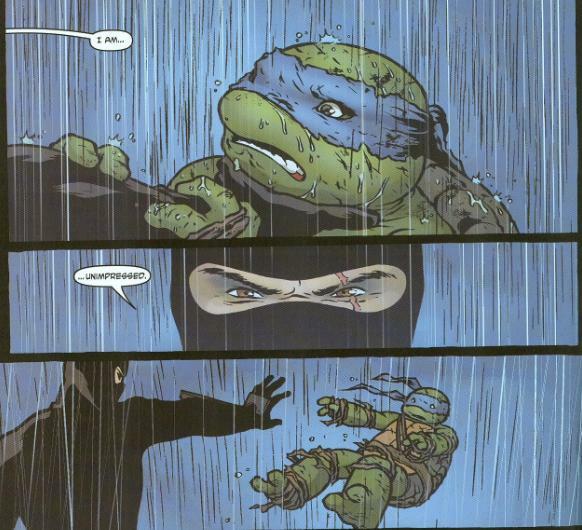 The events of the Ghostbusters crossover are mentioned in TMNT #41, albeit Donatello has to refer to them as "the ghost guys" for legal reasons. Where's the review for TMNT Universe #6? Where is the review for TMNT IDW #68? Firstly, I cannot tell you how much I appreciate what you’re doing here! THANK YOU SO MUCH! Secondly, where will the free tmnt day sampler place in the timeline? 9-14, Carmelo Anthony Special, Batman/TMNT: between Tale of The Yokai (Renet is referenced) and Dinosaur Seen In Sewers! - I'm assuming that "Operation: Break Out" occurs shortly before "Showdown". Same with Into Dimension X/The Invasion and Dinosaur Seen In Sewers!/Annihilation Earth! - Except for Mutanimals origin, stories don't go back in time. - if Super Robo Mecha Force Five isn't proof enough for you,TMNT NAA all the way to issue 22 have Kraang running around non-conquered city; something that didn't happen after season 2 (last episodes of season 3 being a special case)It's not really a stretch to assume that last 2 issues also take place during Season 2. - Karai's appearance in Zodiac story could in theory happen after her brainwashing but I've decided to rely on context clues, mostly ending where she's taken away rather than following Shredder. - Robotanimals make no sense. I looked at anything that might count as Shredder's incident, I noted that Mondo and Pete are both Mutanimals, but Pete didn't had helmet, but he put in on later...nothing added up, so it might as well go anywhere. I'll concede that crystal and robot arm might have been just art errors,like Tiger Claw's eye in some issues, in which case this issue fits anywhere between creation of Scumbug and Antrax and Splinter's death. - Judging by hallucination cameos, last issue of Batman crossover was meant for post-"City At War" audience (Shinigami appears) but I doubt that this actually takes place during that time since I've got impression that Kraang were finished After Kraang Prime's death in previous season. After all, they never returned. Too bad that April didn't show up, her outfit would settle discussion. I absolutely love this page and reference it often. Thank you so very much! I do have a question. Where would you recommend placing the IDW TMNT Deviations Oneshot? It’s an alternate timeline so it’s not canon to the ongoing series. But I was just wondering where I should place it in my short boxes. Thank you again! First off, THANK YOU! I have collected nearly all of IDW’s TMNT run. I got started a little late with this one. So, some older micro-series issues have been harder to find. However, I keep my boxes in order by strictly adhering to this list. That has been an incredible help to me. With some other titles I collect, my wife often comments how she has no idea how I come up with the order I place things in. With this though, it takes all the guess work out of it. I’m sure you’re already on it, but I am curious where Rocksteady and Bebop Hit the Road and the new Macro-Series issues will be placed? Thank you again. I am from germany and am currently (February 2019) a little confused. The past few month it seems that the release of the regular TMNT comcis had stopped? I am depending on the volumes, as I am ordering them from germany. IS there, or can you, create a fully updated reading order of the volumes IDW is publishig of this current run? Thank you for doing this as it is invaluable to a trade reader like myself. I hope that you can update it soon as the posters above me have stated. I hope all is well, I kind of fell out from following in the comics and an trying to get back in and noticed the issues and such haven;t been updated/lack of reviews. I hope everythings alright.